Do-it-yourself sliding shelf Installation in as little as 5 minutes per shelf!!! You can diy install our pullout shelfs in as little as 5 minutes. The standard mounting style come with four "L" brackets attached to the slides that allow you to mount our pull-out shelves on top of an existing kitchen cabinet shelf or cabinet floor. Other methods of installing slide out shelves are explained below. We always refer to the clear cabinet opening when talking about the shelf width not the actual finished wood box. The sliding shelf width dimension that you must give us is the clear cabinet opening (dimension A) at the height the shelf will be installed (upper shelves do not usually need to clear the hinges). The is usually the distance between the cabinet face frames for upper shelves or frame to hinge for the lower pull out shelf. This dimension may be smaller due to any intrusions into the cabinet opening or door placement or overlap. It is also important to check to make sure the door opens far enough, at least 90 degrees. In some instances the door may infringe on the opening more when it is fully open. This reduced dimension is the best one to use. Always give us the clear cabinet opening when ordering and we will adjust for the sliding hardware. Our pull out shelves are custom made in 1/16" width increments. If you are installing an upper level shelf there is no need to deduct for the hinges that are at the bottom of the cabinet. The maximum width for our premium 2 3/8" tall pull out shelves is for a 39" cabinet opening. Remember that just because the bottom pull out shelf may need to be smaller to clear a cabinet hinge it does not mean that the upper sliding shelf has to be smaller as well. It is very common for the lower pull out shelf to be smaller than the upper one. Shelves that slide sliding shelves come in depths from as small as 9 3/4" to as deep as 35 3/4" in 2" increments. We usually refer to the 21 3/4" deep shelf as 22", a 19 3/4" is a 20" etc. A standard kitchen cabinet uses a 22" shelf and a standard bathroom takes a 20" shelf. We can go up to 36" deep but the cost per shelf can be over $130 per shelf. To measure for do it yourself pull-out shelves simply check the depth from the inside edge of the kitchen cabinet face frame (the back side of the frame, not the front) to the back wall of the cabinet (dimension B). Watch out for any protrusions such as pipes or electric wires or outlets and adjust the size accordingly. Sometimes it is better to make a pullout shelf that is not as wide but can then be full depth rather then a shelf that is full width but 3" to 4" shorter. If you have a no shelf rear socket (see below) installation, and the cabinets are over 24" deep you will need to special order deeper shelves on longer slides. Slides up to 31 1/2" long are available. 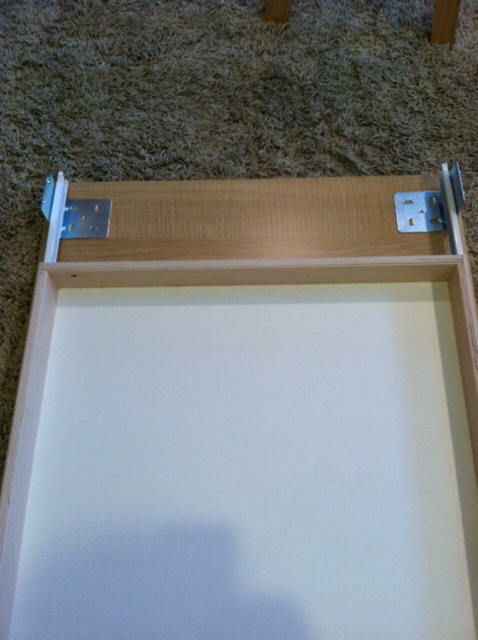 There are three potential mounting arrangements for a sliding shelf. Existing full shelf, a half shelf, and no existing shelf. A base mount is pretty much as it sounds. It is mounting to an existing shelf or to the base of the cabinet. This is perhaps the easiest installation available and also the strongest. The drawer slides will have four "L" brackets attached and these "L" brackets are secured to your existing shelf or cabinet floor. We use a specially made bracket that is designed for this purpose. In framed cabinets this L brackets sits behind the face frame. This brackets lifts the pull out shelf 5/8" above the surface it is mounted to. If you have a frameless cabinet you may need to deduct for the L bracket, see section below this paragraph. It is suggested that if the cabinet has adjustable shelves and if the hardware for this is plastic, the hardware should be replace with metal hardware. It is also necessary to secure the back of adjustable shelves so that they can not tip up when the sliding shelf is extended. This is accomplished simply by insert a couple of screws in the back or side walls with the heads of the screws protruding enough to hold the shelf down and prevent tipping when the slider is extended. If this is your set up specify full shelf on the order page. What if there is no existing shelf? Just as it sounds the no shelf installation is for locations where you want to install a Pull Out Shelf and there is no existing shelf. There are two types of no shelf installations. The first is with rear mount sockets. Plastic sockets are mounted to the end of the sliding hardware and are attached to the cabinet's back wall. The front of the slide is attached to the cabinet face frame as with the half shelf installation. The second method of installing with no shelf is to side mount. Spacers are used to attach the slides directly to the cabinet sidewalls. The sidewalls must be thick enough so that the screws do not pop out to the outside. If you are installing a series of shelves in one cabinet it may be better to cut a piece of wood the same thickness as the side to build it out as needed. If this wood is mounted vertically from the base of the cabinet up the installation can be very sturdy and support higher weight items such as canned food in a pantry. The same requirements for measuring apply for the no shelf install as they do to the half shelf installation. Make sure to order the spacers that you need when placing your order. We offer two types of slides for our pull out shelves. The standard slides are 3/4 extension and we also offer as an upgrade full extension slides. The standard 3/4 extension slides work great for most installations. For a regular kitchen cabinet a 3/4 extension slides puts items that are in the back of the cabinet with the shelf closed, up to where the front items were after the shelf is extended. In other words 3/4 extension slides make the back of your kitchen cabinet accessible. Full extension slides do have their place. If you have a pantry and want to set can foods on a shelf and be able to access the back can the full extension slides will do that for you. The other location is if you want a media shelf with DVD or CD flip strips the full extension slides give you full access. Other than that you will really just be wasting your money to upgrade to full extension drawer slides. The full extension slides are three part and they are a little bit confusing to assemble. There is also a "bump" when the middle member is extended. It is also important to note that full extension slides will not work for the half or rear mount installations. Looking for a do it yourself home improvement project to make your life easier? 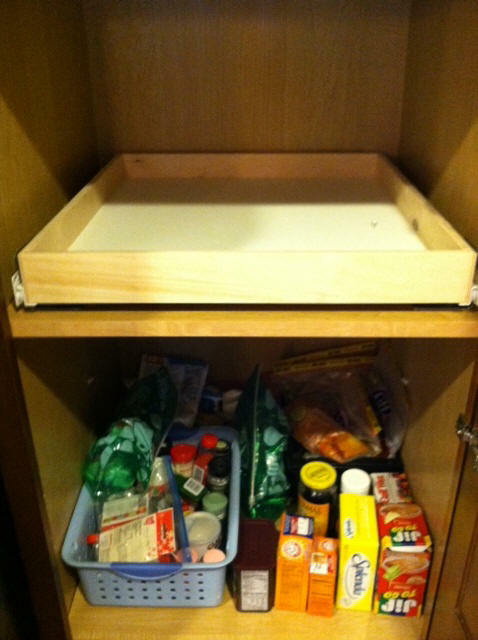 Here is what you need to know to do-it-yourself install our custom made pull out kitchen shelves. There are four ways to mount Shelves That Slide into your cabinet. The first and most common is mounting on an existing full size shelf or cabinet base. The second is mounting to an existing half shelf that is 6" - 12" deep. The third is to mount to the rear wall with sockets. The forth method is mount to the cabinet side walls. All of these installation methods have similarities. We will cover the basic steps first, then you can go on to the specifics for your method of installation. The number one tip is to let the shelf be your tool for setting the slides. There are points in every method of installation that will be easiest to accomplish when you use the shelf as your placement guide. The drawer slides that we use have a control side and a free side. The right side slides are the control side, the track that the wheel rolls in is a captive one. The metal is bent around the wheel and the wheel will only track in that groove. The left side slide is the free side that allows for adjustment of the assembly. For this reason it is very important to pay attention to the left side slide. Any problems with slide alignment will be evident here, the right side will align itself. The easiest and usually strongest method of installing Shelves that Slide is when you are mounting onto a full depth existing shelf or the cabinet base. The first thing you need to consider is the existing shelf permanent or is it adjustable. If it is a permanent shelf you can go straight to installing the slides. If it is adjustable you need to look at two things. The first is what are the clips or pins that are holding it up made of? If they are plastic you need to replace them with metal clips or pins. The front mounting of the shelf will be subjected to twice the weight it is now exposed to when you extend a loaded shelf. The second consideration goes right along with the first in that when the loaded shelf is extended it will want to lift up in the back. This is easily remedied by placing a couple of screws in either the back or the side walls (which ever is thicker, but don't go through to an exposed wall) just above the existing shelf and leave the head sticking out far enough to hold the screw down. 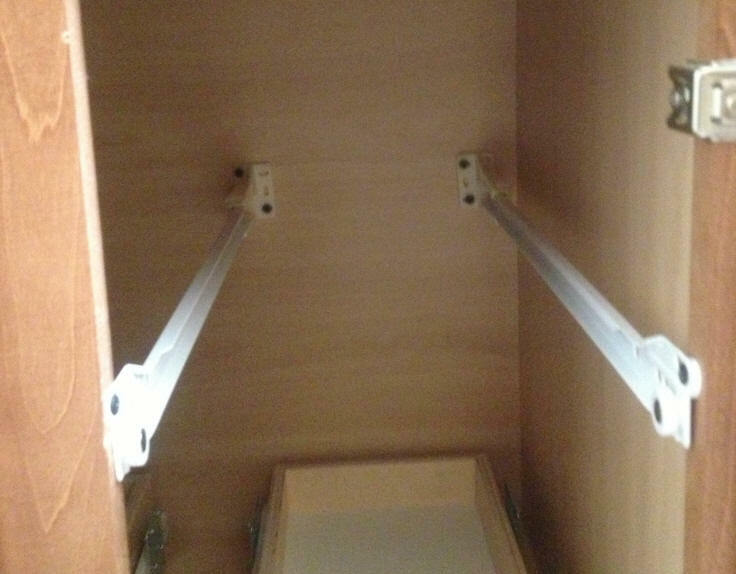 For a full shelf installation you should have two "L" shaped brackets on each cabinet slide. The wheeled end of the cabinet part of the slide is the front. Set the slides onto the existing shelf or cabinet base at the approximate width of the sliding shelf. Engage the shelf slides into the cabinet slides by setting the wheeled end of the shelf slide over the wheeled end of the cabinet slide. The most important side to get in place is the right side. You can always slip the left side into place after getting the right side in properly. Insert the shelf fully into the cabinet and align the front of the shelf to be square with the cabinet front and have the proper set back. The proper set back depends on your cabinet depth but it is usually about 1/2" to 3/4" back from the inside edge of the cabinet face frame. Get your screwdriver ready! When you have the shelf adjusted press down slightly and slide the shelf forward just far enough to expose the rear brackets. Insert a screw in one of the slots in the right rear bracket. Use the hole that goes side to side so you can adjust it latter, tighten moderately. Now slide the shelf back into place and check the alignment. When it is adjusted properly slide the shelf out again to expose the rear bracket and place a screw in the opposite side slotted hole in a slot that goes from left to right and tighten moderately. Again slide the shelf in and check alignment. If all is well you can carefully slide of the shelf without disturbing the position of the front brackets. This may take a couple of tries. Install screws in the front brackets the same as you did for the rear brackets. Insert the shelf again and check alignment. Remember to pay careful attention to the left side slide if the gap is too large in the rear the shelf will roll great but as soon as you add weight you will get a bump when you slide it out. After you get everything aligned you can remove the shelf and install a screw in the center hole of the bracket to lock it in place, two screws per bracket is all that is needed. Congratulations your shelf is done!!! Well almost, see plastic thing. Half Shelf installations will not work with full extension slides.The second method of installing sliding shelves is also the second best and the second easiest. You will need a small level, preferably one with a magnetic strip on one side. Check the existing shelf to make sure it is secure and can not lift up. Also check to make sure the hardware that supports the existing shelf is metal. If you have plastic hardware and plan on loading more than lightweight items into the shelf you will have to replace the hardware with metal. The slides for your half shelf installation will have one metal "L" shaped bracket mounted toward the rear. The end with the wheels is the front! If you have brackets in the rear and front, the front ones will not be needed and should be removed. Set the rear bracket on the existing shelf and place the front edge of the slide against the cabinet face frame, back about 3/16" from the front. Place your level on the slide and level it. When you have the slide level mark the location of the front hole in the slide. 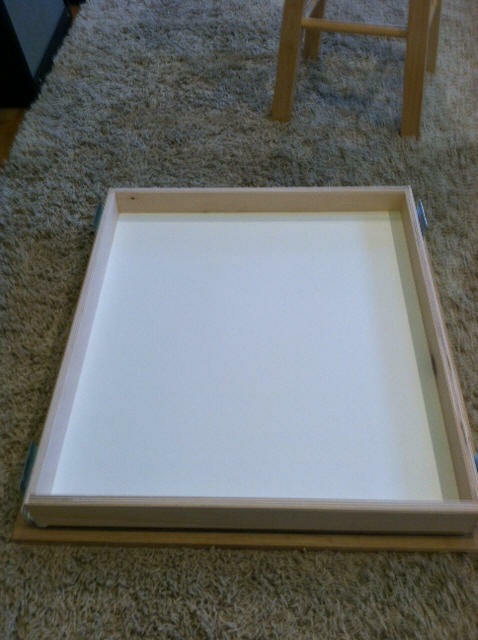 You can then measure the height and make a corresponding mark on the other side face frame. It is best to drill a small pilot hole to prevent splitting, before screwing the slide in place. After you have the front of the slides attached you can set the shelf in place by lifting the wheels on the rear of the shelf slides over the wheels on the front of the cabinet slides. Pay careful attention to the right side slide. Insert the shelf all the way into the cabinet and align the shelf to be square with the cabinet front. If there is too much space between the cabinet face frames you will need to insert spacers or washers to build out. You can order spacers from us in 1/8", 3/8", and 1/2" sizes. You may also be able to find something similar in a local hardware store. Get your screwdriver ready! Check the alignment of the left side slide and when it is properly aligned press down slightly on the shelf and extend it far enough to see the rear bracket. Place a screw in one of the slotted holes and tighten moderately. Reinsert the shelf and check slide alignment. When alignment is correct repeat the process of extending the shelf and insert a screw in the other side's bracket. Again insert the shelf and adjust as needed. When everything is aligned extend the shelf again and place a screw in the center hole of the bracket to lock it in place. Congratulations your shelf is done!!! Well almost, see plastic thing. Half Shelf installations will not work with full extension slides. Well it will work but you must use side build up, you can not attach them to the cabinet face frame. Rear mount sockets are a great alternative mounting for shelves where there will not be much weight. They are perfect for adding a shelf in a bathroom cabinet. The main limitation is if they are loaded with a lot of weight they tend to only be good for a year or two before they succumb to the stress. The first step is to determine the height that you want the shelf. Make a mark on both cabinet face frames for the bottom of the shelf. Insert the cabinet slides partially into the plastic sockets (you must have specified a rear socket installation when ordering) note the brackets are different for left and right sides. Attach the front end of the slides (the end with the wheels) to the cabinet face frame where you marked. You will need to push the slide slightly against the back wall of the cabinet to get the socket seated to the needed depth. Install the shelf by lifting the rear end of the shelf slides (the end with the wheels) over the wheels on the front of the cabinet slides. Slide the shelf in completely and align it to be square with the front of the cabinet. Now comes the fun part. Make a line on the back wall to mark the position of each slide for the horizontal placement. You can now remove the shelf and place a level on the cabinet slide. Align the slide with the previous line that you made and level the height. Now you can either install one screw in the socket or mark another line for the vertical position. Repeat this process for the other side and after you have one screw in each socket reinstall the shelf and check for proper operation. Once you have the shelf adjusted, install at least one more screw in each socket. If you are having trouble getting the shelf to slide smoothly make sure the slides are parallel to each other and not twisted. Congratulations your shelf is done!!! Well almost, see plastic thing. Rear mount sockets will not work with full extension slides. Also they will not work with shelves deeper than 21 3/4" unless longer slides are used. When you need more weight capacity than the rear socket method can provide and you either don't have or don't want full or half shelves in your cabinet, the answer is side mounting. We can provide spacers to install the cabinet slides to the cabinet side walls. The problem is the cabinet side walls are usually not more than 1/2" thick and there is about 1" of space or more that needs to be spaced out. Leverage will lead to this being a weak installation. However if you can install vertical strips of wood on both sides (two on each side, one near the front and the other near the back) that provide the proper filling to match the space behind the cabinet face frame, a side mount installation can be the strongest and most space efficient installation. It is best to use a piece of wood the same thickness as the space behind the face frame that runs from the bottom of the cabinet to above the height that you want the shelf installed. You can glue and screw this piece of wood in place to make a secure attachment. After the wood is installed you can measure up and make a mark where you want the slides installed. Simple screw the slides in where marked and you should be able to install the sliding shelf. Just lift the rear end of the shelf slides (the end with the wheel) over the wheels on the front end of the cabinet slides. Insert the shelf fully and check for alignment paying careful attention to the left side alignment, adjust as needed. Congratulations your shelf is done!!! Well almost, see plastic thing. Finally we come to that white plastic thing. That thing is a door protector. There is one door protector per shelf included. If you have a cabinet with two doors closing on one shelf (a door on both the left and right side with no center divider) you will need two door protectors per shelf. Please request the extra door protectors under special instructions. No door protectors are needed for the economy shelves due to the extended front wood trim. The door protector is mounted to the side of the shelf. The purpose of the door protector is of course to protect the door. The plastic sticks out about 1/16" more than the drawer slide to keep you from scratching the door in case it is not opened fully before sliding out the shelf. Just screw the door protector to the side of the shelf (one screw). Watch for hinge clearance and if the door has a recessed panel make sure you mount the door protector as low as possible. The door protectors will not work on standard height shelves with full extension slides. Fortunately the front of the full extension slides is rounder than the 3/4 extension so the pullouts do not need them as badly. Please note: The actual size of the wood box is 1" less than the size of the clear cabinet opening that you provide. 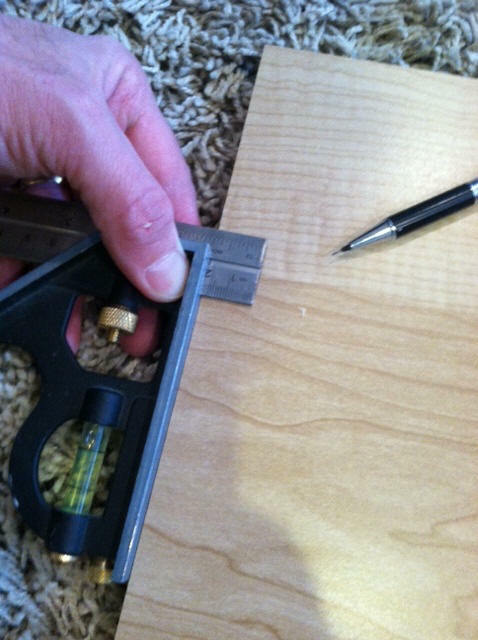 This is to allow for the sliding shelves slides which use 1/2" on each side and must pass through the cabinet opening. We tell you that only so that when you receive the shelf you do not think we made an error. Do not adjust your width thinking that somehow this inch can can sit behind the frame because if you do your shelf will not fit! This page is offered as a guide for installing a pull out shelf and it is not intended to offer every detail for every possible installation. It is expected that the home improvement do-it-yourselfer has sufficient knowledge as to judge the soundness of their installation of kitchen and bathroom shelves. My assembly instructions follow. I had a full non-adjustable bottom shelf in my cabinet, so I only wrote the instructions for this option. The number one tip is to let the installed right side cabinet guide be the control for installing the left side cabinet guide. The right side sliding shelf slide has a bent edge around the wheel track and the wheel on the slide is to the rear. 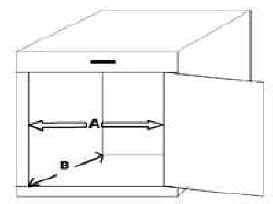 Assemble the right cabinet guide with its wheel in front to the right sliding shelf slide. Place this assembly onto your cabinet shelf and place it so the back of the sliding shelf touches the front of your cabinet back. The shelf is centered on the door opening. Now slide the left side cabinet guide with its wheel to the front under the left sliding shelf slide (no bent over track edge). You are now ready to set measurements for proper assembly. First check for set back dimension. Move the shelf assembly forward to within ½" to ¾" from the back inside of the face frame. It should be centered on the available opening and squared to the front of the cabinet back. Get your screwdriver and supplied screws. All screws are to be lightly hand tightened until final alignment is accomplished. Lightly push down on the right side of the shelf as you move it towards you to expose the rear bracket on the right cabinet guide. Maintaining the above alignment, drive a screw through the rear front to back slotted hole in the exposed rear bracket. While still maintaining alignment install a screw into the front left to right slotted hole of the same bracket. Remove the shelf and the left side cabinet guide leaving the screwed in place right side cabinet guide. This will expose the front bracket on the right cabinet guide and once again check square to the front of the cabinet back and install two screws just as was done to the right rear bracket. Next step is to install the left side cabinet guide. While holding the left side cabinet guide against the cabinet shelf bottom and approximately a shelf width left of the already installed right cabinet guide, reinstall the shelf onto the attached right side cabinet guide and onto the left side cabinet guide. Check your alignment and square. Install two screws into each bracket (front and back) on the left side using the same method as used on the right side cabinet guide. Reinstall the shelf into the right side cabinet guide and onto the left side cabinet guide. Move the shelf back and forth and if it binds adjust the left side cabinet guide to allow the shelf to move easily. When you are satisfied everything is aligned and moving smoothly install and tighten a screw into the center hole of each of the four brackets. Tighten all other screws. Congratulations your shelf is done!!!! Well almost, see the plastic thing. Finally we come to the white plastic bumper, which is utilized to prevent damaging the inside surface of the door. This might occur when closing against a partially protruding shelf or when the door is in the way of your pulling out a shelf. The plastic bumper is mounted with one screw to the front of the shelf closest to the door hinges. Watch for hinge clearance and if door has a recessed panel make sure you mount the door protector bumper as low as possible. Included with very wide shelves, two bumpers are supplied assuming the opening has two doors per shelf. This "honey do" project was a snap and I believe if you use my ideas other neophyte installers will be as pleased as I am with your product and its ease of installation. Steve, the shelves arrived and are installed -- thanks! I installed your drawers on movable shelves. I read your installation instructions on your web site several times through, just to make sure I would do the job right. Each time through, though, I kept thinking to myself, there has to be an easier way than sticking my head back into a cramped, poorly lit pantry, trying to align, then screw down, these brackets. Now, I'm no pro, but I've done my share of DIY projects. There's a couple of things I can almost guarantee with a project like this. First, there will be bloody knuckles. The second thing, sometimes related to the first, is that there will be cursing. So I'm reading your instructions, thinking, there are tight dark corners in there, and drawer slides that need to be lined up perfectly (or at least, close to perfect) -- there will be cursing for sure, and probably bloody knuckles! Why, I'm thinking to myself, do I have to attach those slides in place? 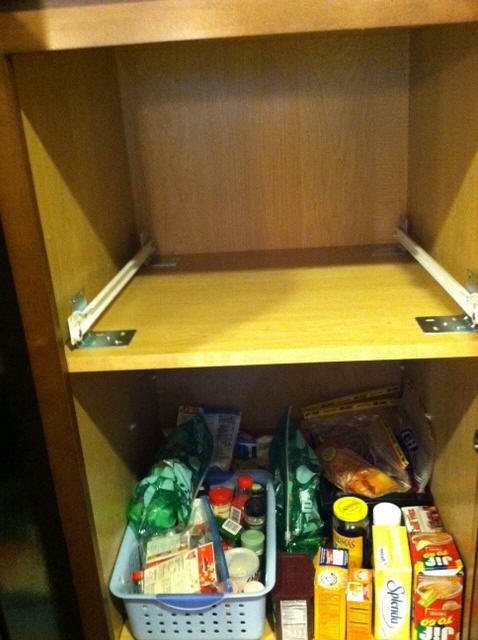 Why can't I take these removable shelves out of the pantry and fasten the slides in a nice, open, well-lighted space, where there's plenty of room? All I have to do, I'm thinking, is get the proper measurements, mark the shelves, and it should work. I figured I'd try the first of the four shelves, and if it worked, I'd finish the other three that way. If not, the worst case scenario is that I have to turn the shelf upside down to avoid misplaced screw holes, and start over, using your instructions. I took some photos to document the process -- feel free to use them if you'd like. And, if these instructions make sense, use them, too. 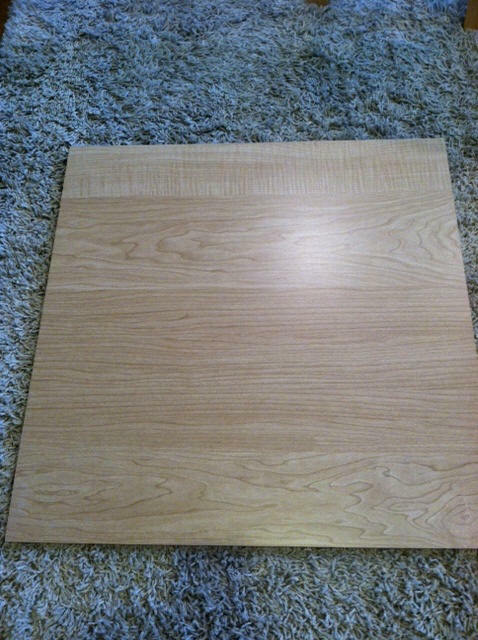 The "bare shelf" picture shows the removable shelf -- pretty typical, laminated mdf. The only trick here is to make sure you work with the laminated edge exposed - the back edge is bare mdf, and you want that towards the back. My shelves are 22 1/4" wide. I placed the drawer, in the slides, on the shelf (see "drawer in brackets no screws" picture) and measured. That width was 20 3/4". The difference is 1 1/2"; divided by two, that's 3/4" on each side. This approach will only work, I suppose, if your placement (like mine) is symmetric, same clearance on both sides. The front to back placement was simply a matter of judgment, making sure there was enough clearance for the pantry door. I took my handy square, set the ruler gauge at 3/4", and marked a line on both sides, front and back, approximately where the slide brackets would be. See photo, "measuring in from the side". I did the same from the back edge of the shelf, with the proper distance. On subsequent shelves, I knew the 3/4" was constant from the sides, and for the back edge, I simply loosed the nut on the gauge, adjusted the ruler, and used that. Next, I screwed in the slides, one screw per bracket, in the slots (not the center hole), so I would have "play" in all directions, if needed. See photo, "one back screw." I inserted the drawer, and tested it out, making sure it glided smoothly. When I was happy (very, very little adjustment was needed), I pulled the drawer slightly forward, and placed a screw in the center hole. I carefully removed the drawer, tightened the screws in the front slots, and placed the center screw. I tested the drawer again -- still glided smoothly. I then placed the shelf in the pantry. See photo, "Shelf in place." Once again, I placed the drawer in and tested, making sure there was smooth glide and clearance. See photo, "Drawer in place." Satisfied, I placed two screws into the back wall, as you suggest on your site, to make sure the shelf doesn't tip forward when the drawer is extended. The first time worked like a charm. I was pleased, so I decided to take the photos of the second shelf (the ones I have attached). On the third, I thought I'd time myself, since I had the process down. Using only a hand screw driver (no power tools), and taking my time, no hurrying, the third shelf took 7 minutes, 17 seconds. I didn't time the fourth shelf, but I think it was faster than the third. 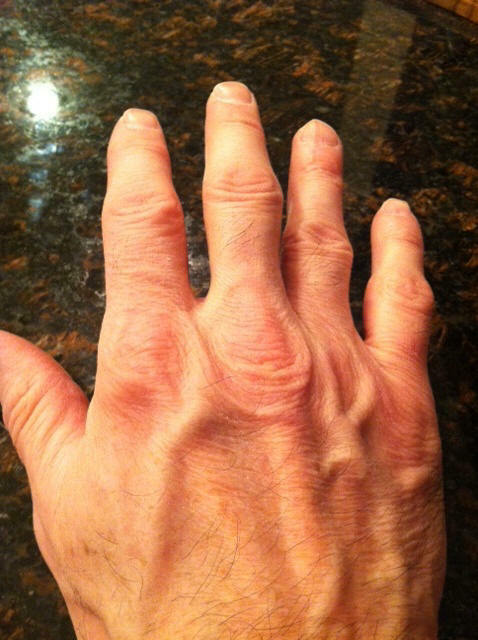 And, as you can see from the last photo, no bloody knuckles, and (you'll have to take my word) no cursing! My wife and I love the shelves, and we will definitely recommend them to all our friends!